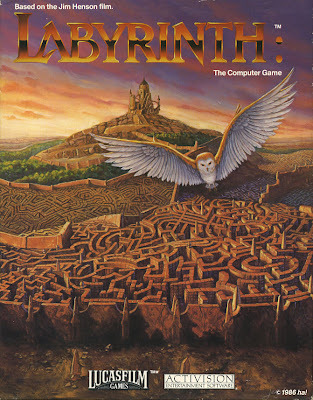 Labyrinth was the first adventure game by LucasArts. It did not use SCUMM (Maniac Mansion was the first game to use that), but it was a graphical adventure game throughout most of the game. You can choose between a boy or a girl. You are watching the movie Labyrinth (the Lucasfilm/Jim Henson movie this game is based on), and are sucked into the labyrinth through the movie screen. The game starts out as a text adventure, but once you get to the movie theater, it turns into a graphic adventure. The game designers wanted it to be the game parallel to The Wizard of Oz switching from black and white to color once Dorothy reached Oz.